Windows Vista includes an extensive reworking of core OS elements in order to provide content protection for so-called "premium content", typically HD data from Blu-Ray and HD-DVD sources. Providing this protection incurs considerable costs in terms of system performance, system stability, technical support overhead, and hardware and software cost. These issues affect not only users of Vista but the entire PC industry, since the effects of the protection measures extend to cover all hardware and software that will ever come into contact with Vista, even if it’s not used directly with Vista (for example hardware in a Macintosh computer or on a Linux server). This document analyses the cost involved in Vista’s content protection, and the collateral damage that this incurs throughout the computer industry. […] The Vista Content Protection specification could very well constitute the longest suicide note in history. I’ll withhold judgement until I hear from people who know hardware design better than me, but this sounds like a major stumbling block for Vista adoption. The underlying market dynamics in the computer market, as Nick Carr recently said it, is that "hardware wants to be software, and software wants to be free." The Vista content protection specs seem to want to reverse that. I don’t think it will work, long-term: As Gutmann points out, cheap and single-use hardware devices can be created that circumvent premium content protection quite easily. And to think that I just went out and bought a Media Center PC. Arrgh. I have been thinking about buying a Macintosh as my next laptop, this just about clinches the decision. Update Dec 31st: This is turning out to be an interesting discussion, see Joho and Bob Cringely for viewpoints. What a pity Scoble has left Microsoft. Update Jan. 14, 2007: There is a good interview with Peter Gutmann at Tvit.tv. Amongst other things, he says he got the phrase "longest suicide note in history" from a bad political program – and that you could not listen to the podcast of the interview without having parts of your PC either shut down or intentionally lose performance. The interviewer describes Vista, with it’s 30-times-per-second system authentication check as "insanely paranoid". Somehow I don’t think this will fly, and not just because hackers will fix it. It has never been good strategy to go to war against your customers. This entry was posted in Digital reflections on December 26, 2006 by Espen. This should be obvious, but people don’t like hearing it because there’s the assumption that simple = stupid. But it’s not true; indeed, I find from personal experience that the stupidest writers are the ones whose writing is positively baroque in form. All that compensating, you know. Besides, I’m not telling you to boil everything down to "see spot run" simplicity. I am telling you to make it so people can get what you’re trying to say. If I could only do that consistently myself. His points about grammar are also interesting – one of the few things Norwegian schools do better than US or English schools. I have experienced myself, not infrequently, that I will know correct English usage better than native English speakers because I know some grammatical principles. Anyway: Key point for non-writers: Speak what you write. If you can’t speak it, don’t write it. Simple indeed. This entry was posted in Quotable on December 25, 2006 by Espen. A few years ago, most European universities began using letter grades (A, B, C, D, E and F). This actually made grading harder than before. We used to have numeric grades, on a scale from 1 to 6, with 1 as the best grade. Then I would grade reports simply by measuring their thickness and multiplying with a factor (the thinner the report, the better the grade). Sorting exams into categories is much more complicated, with lots of if..then statements in your spreadsheet. Luckily, Daniel Solove has, very collegially, shared his robust method of grading. Continuing the tradition of learning from Law School faculty (after all, they invented the case method), I think this will be my preferred method from now on. Christmas is approaching, and our new building has plenty of staircases which seem purpose-built for this grading method. The only problem is that more and more students submit exams electronically. I think it is inefficient and costly to print out all the papers before grading them. Could there be a market for an electronic grading toss simulator? This entry was posted in Humor on December 14, 2006 by Espen. Interesting little article on how Google computes PageRank. This entry was posted in Academically speaking on December 7, 2006 by Espen. Don’t use big-name US companies (General Motors, General Electric) as examples without explaning who they are. Outside top management echelons, most people will only know their brand names (incidentally, for GM in Scandinavia, that is Opel) and not the companies themselves. Be very careful about using banking examples – US banking is seen as very backward by Europeans, because of the continued use of paper checks. In reality, the US banking industry probably leads the world in technical innovations, but services between banks are not nearly as integrated as in Europe – and therefore are seen as backward. Plus, European banks have a wider range of services in the payment area – services that credit card companies and PayPal do in the US. Be careful that you don’t talk about Europe as if it was a country like the USA. There is much more variation between countries in Europe than between states in the US – language, history, culture, attitudes, economics, etc. Check each country on Wikipedia (particularly economics if you are speaking to a business audience) and make sure you don’t say things that are wrong about a country. Don’t refer to going to church in your talk (for example, refer to someone as "we belong to the same church" or similar). In Scandinavia, at least, less than 10% of the population goes to church regularly, and religion is a very personal thing. You will be seen as belonging to some strange cult or something. Some opinions which are labeled "conservative" in the US, are considered fascistic or simply crazy in most of Europe. The "right to carry arms", anti-abortionist sentiments, and, quite frankly, much of what George W. Bush is doing at the moment is viewed with horror by many Europeans. While most audiences will view an American speaker as a any speaker on a specific topic, mentioning that you are a member of the NRA will (for those in the audience who knows what that is) position you as a person with a frighteningly loose grip on reality for most European audiences. This entry was posted in Business as unusual on December 1, 2006 by Espen. 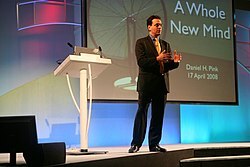 I recently had the pleasure of hosting Dan Pink at a conference here in Norway. Dan is a writer for a number of august publications and made his name with the book Free Agent Nation a few years ago. His most recent book is A Whole New Mind: Why Right-Brainers Will Rule the World, in which he makes the relatively simple point that because of Abundance, Asia, and Automation, all work that is explicitly defined will move to the place in the world where it can be done the cheapest. This means that competition (be it in products or services) will take place less on price (utility) and more on significance, i.e., design and emotion. I tend to be very sceptical about professional speakers, partly because I am Norwegian (and thus a member of the most cynical group of people in the world,) and partly because 10 years on the rubber chicken circuit has given me a severe allergy to gurus giving canned speeches. Dan turned out not only to be very solid in his analysis, but also very attuned to his audience. My job was to lead a discussion on how his ideas related to a Norwegian, as opposed to American, reality. The discussion was not necessary, because Dan and I had a couple of conversations beforehand and he took the trouble to not only read the stuff about Norway I sent him, but very carefully tailor his talk so that language and examples related to something the audience knew.